Hockey analytics have come a long way since the early days of the Edmonton Oilers blogosphere at the turn of the century. We have seen Corsi turned into Fenwick, then adapted into score-close and then score-adjusted variations with added context. We have followed the development of one of the most impressive single-man data collection efforts in sports history, and seen it fundamentally change the way the game is coached. We have celebrated some of the movement’s first and even second-generation hirings by hockey teams at all levels in roles of mass importance. We have dCorsi and xG and Neutral Zone Fenwick and AdjGSAA and WAR, a wealth of riches. Most of our early advances focused on even-strength play, which is logical considering its prominence. There were limited hours in the day, and it made sense to study a part of the game that featured all 36 skaters and two goalies, and whose sample size grew rapidly. But it has now been upwards of 15 years since the first internet forum group devised the idea of adding together shot attempts, and the truth is, there is an area of the game that we have made very little progress towards quantifying: Special Teams. Tomorrow, I will discuss the history of special teams analytics, because there have certainly been attempts, if brief, to analyze them, and I am certainly not dismissing what has been done before. But the time has come to update the analysis, to build on it, and to supplement the data at our disposal in order to do so. But first, why special teams in particular? 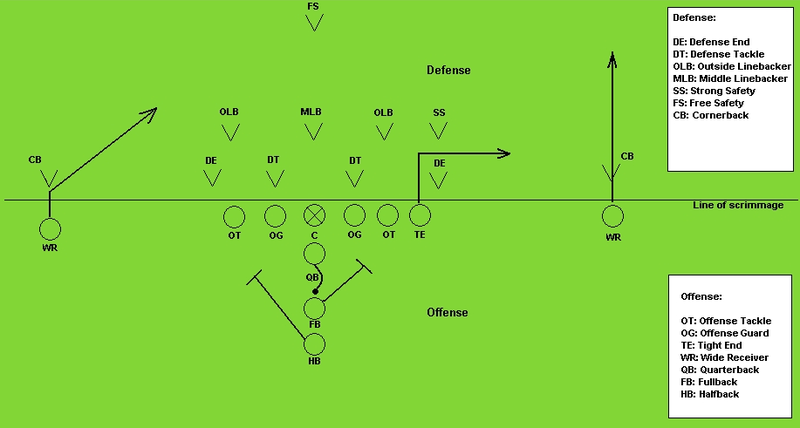 Spielzug Playbook by Fireblade 9977. Licensed under public domain via Commons. For years, the criticism of the use of numerical analysis in hockey has been the sport’s free-flowing nature. Baseball is a fairly simple game to quantify (relatively speaking) because it can be easily broken down into individual encounters and stop-start plays. Hockey analysts have no such luck. This is why defense has been so difficult to assess, and why separating teammate effects is such a tough task. But special teams are different. By special teams, of course, I refer to power play and penalty kill situations. You may know power plays as “that thing that seems to be becoming less and less relevant each year.” And yes, it’s true, power play opportunities, since a spike following the lost season, have consistently declined. My hypothesis, however, is that with the push for increased offense, we will see a renewed emphasis on enforcing the rulebook in the next few years. It certainly won’t entirely solve the league’s perceived offensive drought, but it will push the needle. And even if it doesn’t, power play scoring can be the difference between making and missing the playoffs, and thus millions of dollars in playoff revenue. It can also separate those that flame out and those that hoist a cup. If the New York Islanders hadn’t gone 0/14 on the power play in the first round of the playoffs last year, I would imagine that their tight seven-game loss to the Washington Capitals would have turned out differently. If this season’s Philadelphia Flyers were clicking on the power play at last year’s rate of just above 23 percent rather than their current 16 percent, they would have 10 additional goals, and using Pythagorean estimates would be in a playoff spot rather than sitting at 12th in the Eastern Conference. In a parity-dominated National Hockey League, the margins do matter. Special Teams account for approximately 20 percent of NHL game time. That 20 percent does matter. But back to baseball — that game filled with stop-and-start sequences and repeating events. Hockey is a fluid sport, and there are very few occurrences that repeat under the same circumstances a sufficient number of times to appropriately evaluate them using statistical methods. But those situations that do repeat occur mostly when one team is down a man. And even with small sample sizes, there are ways to combine numbers with video analysis and common sense to make educated guesses. Correlations aren’t everything. Deng shot 121407 by Gavindow. Licensed under public domain via Commons. A hockey power play actually quite closely resembles a half-court offense in basketball, or maybe more so a loose full-court press. The offensive team must devise a way to get the ball up court amidst loose but structured defenders. Then those players must find a way to create 2-on-1 matchups against defenders and find openings to strike. There are numerous set plays, both to advance the ball/puck up court/ice, and more yet when it comes to penetrating once in formation. Basketball has done brilliantly thus far using mountains of data to study key theories regarding shooting, passing, and defensive efficiency. With more data, there is no reason why we couldn’t do the same with hockey power plays. But of course we don’t have that data. The NHL has been slow to implement tracking technology, in part because of the difficulties inherent in tracking a fast flying little rubber disc, not to mention dozens of players frequently hopping on and off the playing surface during play. Those companies that do exist are mostly proprietary, so in the public eye analysts are stuck in special teams purgatory. So this summer, I decided to change that. Power plays have been an area of fascination for me since I had the privilege of working in the Washington Capitals radio department and witnessing their man advantage torch teams in an almost tiki-taka sense on a nightly basis. What is it that they do so well? And why have other teams failed to replicate it on a consistent basis? For the 2015-2016 season, I have devoted most of my analytic efforts to analyzing power plays. I have tracked every 5-on-4 and 5-on-3 advantage for the Capitals, Flyers, Tampa Bay Lightning, New York Islanders, Montreal Canadiens and Toronto Maple Leafs, and I chose these teams for a reason. If it isn’t the Capitals, the 2014-2015 Flyers are the team whose power play has impressed me the most the last few years. They embrace many of the same principles, at least on the first unit, but with some added wrinkles. The Lightning has similar weapons to the Capitals, featuring sniper Steven Stamkos, but they haven’t managed to generate the same success. So Tampa Bay was an obvious test subject. The Islanders have struggled on the man advantage with a very different power play ideology despite also possessing a bevy of weapons, so I felt the need to include them. The Canadiens have similarly struggled, and star defenseman P.K. Subban has only one power play goal this season. Shooting luck aside, there has to be something to that, so the Canadiens are in. Finally, the Leafs were a late addition, but Mike Babcock has done a commendable job of transforming a power play with minimal relative talent into a strong unit with a shot-first mentality. I was curious how he was doing that. So welcome to the Special Teams Project. Over the final six months of the NHL season, I will be using both the NHL’s play-by-play data and my own tracked numbers to analyze man advantages league-wide, but with a focus on those six teams. Most often, I will be analyzing 5-no-4 advantages, although I may look at 5-on-3 play at certain points, and will eventually dive into some penalty killing data as well. Thank you to the folks at Hockey Graphs for their advice and technical support, to Matthew Henderson for designing this slick logo, and to anybody else I’m forgetting who has helped to this point. Don’t hesitate to reach out with questions and feedback at arikparnass@gmail.com or on twitter @ArikParnass.